Another wrong turn of heliskiing. Are British Airways business practices ethical? 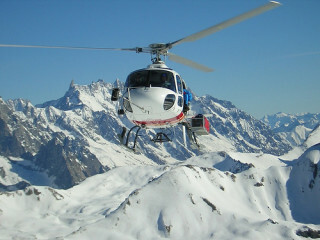 The French Law forbids the use of helicopters or airplanes anywhere in the mountains for leisure purposes such as dropping skiers. But has a loophole as it does not say anything about recovering skiers at a bottom of a mountain or in a designated area. Unfortunately there is a greedy faction of the ski industry, including mountain guides and tour operators, who are keen to offer high adrenaline experiences at the borderline of the law to satisfy a set of customers only concerned by their selfish pleasure without any other consideration. It is though possible to experiment heliskiing practices in Switzerland and Italy, where this activity is authorized, with departures from various places such as Val d’Isère, La Rosière, Chamonix etc… located along the French border. Packages including heliskiing trips flying over the border can be found in multiple places such as the Internet and tourism ads. But it is not that common to see a high profile commercial company such as BA to openly encourage its customers to circumvent the spirit of the law and be environment unfriendly. Is this a proper code of conduct? In our high flying fast moving society, visitors of the Alps coming from abroad, are not always aware of the possible consequences of their actions especially when they are prompted to an activity by the company they trust. Isn’t it a moral duty for such company to provide guidance in line with customs and regulations of their potential destinations? Mountain Wilderness believes it is their responsibility to assure that proper and ethical information is supplied to the end users of these invasive means. If the French want to protect the natural heritage of their mountains it is not only because they are concerned that excessive use of helicopters in remote high alpine regions will exacerbate man’s encroachment on an already beaten wilderness; create excessive noise pollution, increasingly disturbing the quiet life down in the valleys; but also because this has a disastrous, harmful, impact on the wild fauna already tremendously stressed and weakened by the harsh alpine climate and long winters. This reality goes beyond borders… and impacts chamois, big horns and grouses finally leaving them without a safe place. 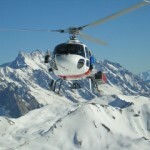 Mountain wilderness is strongly against heliskiing, its national chapters have all undertaken actions to obtain bans of such practices across the alps. During the last few years Mountain Wilderness Italy and Switzerland have reported several victories in their pursuit of summits freed of motorized vehicles whereas In France our action continues for an extended protection of the mountains against such human excesses. BA has been made aware of the negative impact of their article, they have responded positively by promising to remove this content from their online version as a gesture of goodwill but could not publish amendment in their paper version. But in the end the real problem lies with those organizations and people who do not care for the damages they cause to the wilderness. All together we must relentlessly act to reduce their impacts. We encourage you to denounce such unethical behaviors and welcome all the support that people concerned with the well being of our free mountain spaces can provide in our daily struggle for the protection of the wilderness. Mountain Wilderness thanks the anonymous people who have taken the lead with BA on this issue.